Want some excitement on your Caribbean vacation? Looking for an activity that requires a bit of daring? Well Barbados has got just what you're looking for! How about going treking through a underground cave, snorkeling or diving among shipwrecks, or taking flight over turquoise waters? For a small island Barbados has an abundance of activities to get the adrenaline pumping and giving you a great sense of accomplishment. Need to recover from all this excitement? Then head to the beach for a relaxing sea-bath or to soak up the Caribbean sunshine. El Tigre Cruises - Join one of our lunch or snorkel cruises or create your own personal sailing adventure! 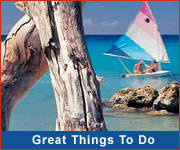 Small Cats Cruises - Enjoy exciting snorkel, lunch or private cruises on board a cosy catamaran! Choose your adventure at Barbados Entertainment Complex - Laser Tag, Adventure Rooms, Virtual Reality Missions, Table Tennis and more! Hike Barbados - Join these three hour hikes each Sunday. Add your comments about Barbados Thrills!